Will they Digg the changes? Digg founder Kevin Rose has told The Guardian that his site will look to add social networking elements to its successful formula. Currently Digg’s social bookmarking – which allows 3 million registered users to submit links to pages they think are cool and allow other people to vote for (or Digg) them. “We're creating algorithms that take a look at what you've dug and compare it to other people, inside the system, in real time,” said Rose. “…So we're working on ways to surface those stories - to find quality content before it becomes popular - but also introduce you to new people based on what you've been Digging." 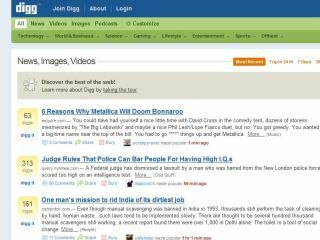 One of the major factors in Digg’s success has been the astounding community that has built up around the site, and the freedom of the audience to decide what’s popular. But Rose is looking at bringing in tools that allows businesses to take more from the results of people’s Digg trends. "Digg will serve as a means of gathering metrics for third party websites, providing them insights into who's digging their content, who they are spreading it to. “We want to enable publishers to have a better idea of which authors are most popular on their site; which content types are striking a core with their readers, and I think we'll provide those tools for them." Of course, this may raise long term questions about the influence of big business on a social bookmarking site, but in the meantime Digg will be focusing on networking its engaged audience.